Approximately 10.5 inches long x 8.5 inches wide x 10.5 inches high. Wardian case terrarium with stained glass panels. 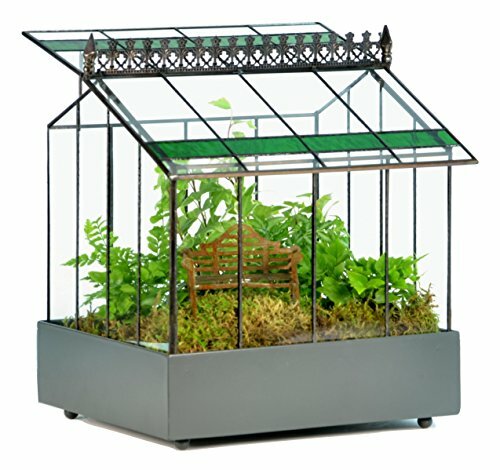 Give your plants a little extra air in this tabletop Wardian case terrarium with opening roof panel. Includes prop for roof, beautiful green glass accents, plastic liner in tray. Perfect for yourself or that special someone. Planting your terrarium: Start with a layer of pebbles and mix in a handful of charcoal chips, spread this mixture evenly on the bottom of your tray. Next add a layer sphagnum moss followed by a layer of soil to nearly fill your tray. Make small holes where you wish to insert your plants. If your plant has a root ball larger than the depth of your tray gently tease out the roots horizontally. Once you insert your plants into the little holes, bury the roots and tamp the soil to help remove air pockets. Water very lightly as your terrarium will be recycling its own water and you don't want waterlogged soil. Place the glass top on your terrarium, sit back and relax. What you place inside your terrarium is entirely a matter of personal taste. Do you prefer a green oasis? Do you enjoy the mystic of a fairy garden? Or perhaps exotic orchids are your fancy? The choices are endless. Your imagination is the only limit. You will want to place your new terrarium in a room with sunlight, but not directly by the window.